If you end up spending too much time trying to perfect you base makeup, you need this set featuring a do-it-all brush, concealer brush and complexion sponge. It provides an even coverage and tone, and it's great for last-minute touch-ups. Complexion: Uncomplicated Brush Set, $45 at Sephora If you're a brush rookie and basically use the same tired brush for everything, this set is a great introduction to the transformative power of a quality makeup brush. This five-piece set has two kinds of concealer brushes, with one specifically meant for your undereye area. 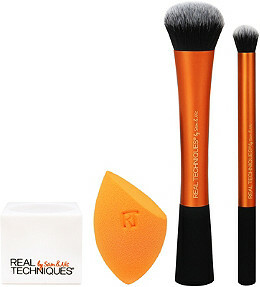 It also has separate brushes for buffing and powder, a foundation brush and even a brush tutorial.